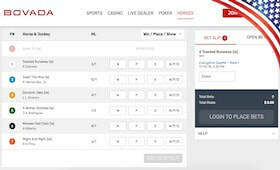 BetOnline is a truly global horse race betting site that welcomes players from the United States, Europe, Australia or Asia. They have been in operation for well over a decade and are regulated and licensed in Panama. Wager on horse racing with Bitcoin, Dash, Litecoin, Bitcoin Cash and Ethereum. Strong focus on Thoroughbred and Harness betting in the USA and Canada. Cryptocurrency deposits and withdrawals are processed for free at BetOnline. Photo ID and a utility bill are requested when you request your first withdrawal. US and Canadian racetracks include Belmont Park, Churchill Downs & Keeneland. iPhone and Android compatible. 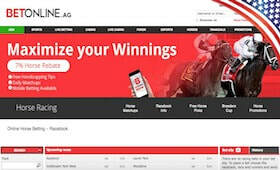 Wager on horse racing from your phone. 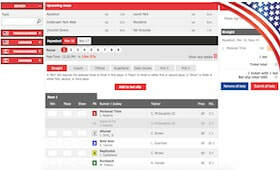 Up to a 7% racetrack rebate plus a $25 risk free horse racing bet when you signup. 50% crypto bonus when you make your first deposit with ETC, LTC, BTC or DASH. 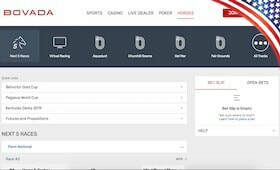 ﻿​﻿Bovada are a giant in the world of sports betting and we're happy to report their racebook is top quality also. They have been one of the biggest names in online gambling for over 10 years so you know your cryptocurrency will be safe. Bovada currently only permit gamblers from the United States and Latin America. Wager on United States, Irish, Australian and UK horse races with cryptocurrency. Bitcoin and Bitcoin Cash are currently the only two cryptocurrencies accepted. There is no charge to deposit/withdraw and deposits are converted to dollars. Crypto betting options include straight, exacta, trifecta, superfecta, daily double. Horse race crypto betting from any Android or iOS phone/tablet is now available. Featured racetracks include Aqueduct, Churchill Downs, Del Mar and Aintree. They offer a bitcoin 50% match bonus up to $500 as well as a regular bonus. Horse racing is big business, and it’s a wildly popular avenue for gambling enthusiasts. Why are horse races so popular with gamblers though? For starters, these races offer huge opportunities for payouts. When betting on horses it’s often easy to choose the level of risk you want to take based on odds. For those willing to accept less favorable odds, the pot can be that much bigger should they win. ​There are also a wide variety of different bets which can be placed on races, giving those who participate in the sport many avenues for success. Horse race betting is a form of entertainment which can appeal to both novice and advanced participants. While it is possible to choose very simple options and still be successful and have fun, if you take the time to learn how it works you have so many more options available to you. Unfortunately, it seems that many of the most popular European sports bookers have not quite caught on to the cryptocurrency craze. Those who are fans of traditional sportsbooks such as Ladbrokes or Bet365 may have noticed that they are lacking in cryptocurrency options, and most bitcoin sportsbooks don’t offer the option of betting on horse races. There are of course a few exceptions which may offer some betting on major races such as the Kentucky Derby, but someone who is truly a fan of the sport will likely be disappointed by the lack of options available. Finding a good a good cryptocurrency based horse betting book will likely be your biggest challenge when looking to take up this hobby or expand your existing hobby into the realm of cryptocurrency, but in this article we’ll go over some options you can use that are crypto friendly.